pristine freshwater habitat and free-flowing rivers that have been (for the most part) spared human development and major resource extraction seen elsewhere along the West Coast. That doesn't mean that Alaska's salmon aren't under threat though. There's increasing pressure to develop Alaska's many resources, including minerals, timber, and oil. Trout Unlimited is working with other organizations and user groups to protect critical salmon habitat so that Alaska's salmon fisheries may continue to thrive. Located in Southwest Alaska, Bristol Bay is home to the world's largest wild Pacific salmon commercial fishery, producing millions of wild salmon each year. Bristol Bay is particularly famous for its sockeye salmon; one of the most sought-after salmon species because of its uniquely deep red flesh, firm texture, and distinct flavor. The fact that Bristol Bay has some of the world's largest wild salmon runs is no coincidence. 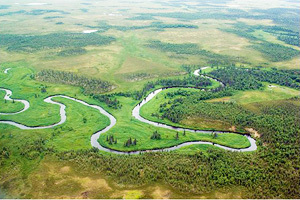 The care and protection under which the habitat and fisheries in Bristol Bay are managed has left salmon habitat pristine and intact, free of dams, mines, and pollution. Bristol Bay's salmon fishery feeds not only the global salmon market, but Southwest Alaska's economy and communities as well. The harvest and processing of Bristol Bay's salmon generates nearly $320 million a year, providing thousands of jobs for Alaskans and others around the country. Pebble, a proposed open-pit gold, copper, and molybdenum mine, situated in the heart of Bristol Bay's wild salmon spawning grounds, would be devastating to the wild salmon populations and fisheries in Bristol Bay. If constructed, Pebble is predicted to produce three billion tons of waste over its lifetime. This projected waste would flow from Pebble into Bristol Bay's rivers which could reduce salmon survival rates, meaning wild salmon shortages and increased prices. So, not only would wild salmon and their fisheries suffer because of the Pebble Mine, but salmon consumers as well. Therefore, Vote With Your Fork for Bristol Bay and help us protect our nation's largest wild salmon fishery. You can also take action and learn more at www.savebristolbay.org. Click here for a list of Bristol Bay Salmon Suppliers. The Tongass National Forest in Southeast Alaska spans nearly 17 million acres with some 4,000 salmon-bearing streams scattered throughout its thick old-growth hemlock, spruce, and cedar forests. The Tongass is not only America's last intact coastal rainforest, but is also one of our nation's last remaining salmon forests. Thanks to the wildness of the rainforest and its waterways, the Tongass is a stronghold for wild salmon, with all five wild Pacific salmon species—Chinook, coho, sockeye, pink, and chum—present in the Tongass' crystal-clear streams. Southeast Alaska's wild salmon support a sustainable, commercial fishing industry, which catches over 60 million salmon annually, bringing in $125 million to the local communities and their economies. Unfortunately, many of the wild areas critical to wild salmon, and subsequently the region's economy, are still open to logging, road building and industrial development. Trout Unlimited is working to change that though and ensure that the Tongass National Forest and its wild salmon get the strongest protections possible before it's too late. For more information on critical salmon watersheds and wilderness areas in the Tongass National Forest, check out Trout Unlimited's Southeast Alaska Roadless Report. Sample some of the wild salmon recipes prepared at Trout Unlimited and Alaska Wilderness League's 2008 Taste of the Tongass celebrity chef events.